ALM Octane and ALM or JIRA maintain separate lists of user list fields, such as for the Owner field. Users in these lists are mapped once for each pair of endpoints. This means that if you mapped the users between an ALM Octane workspace and an ALM or JIRA project when creating a requirement link, the same mapping is used when you create a defect link between the same two endpoints. 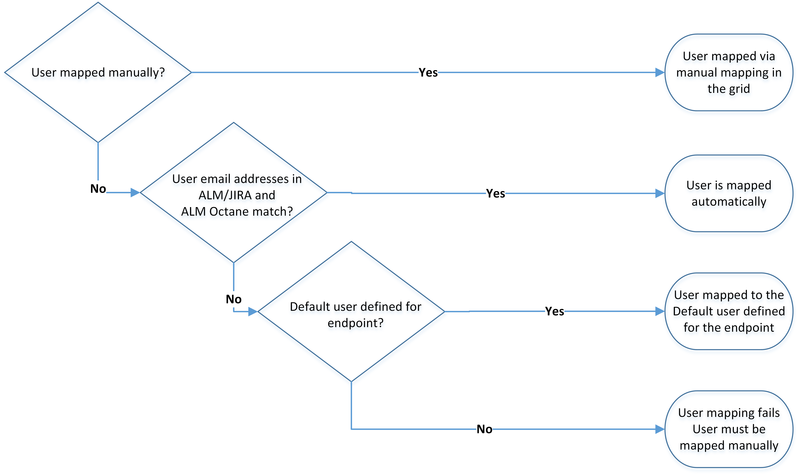 The following chart describes how ALM Octane Synchronizer recognizes mapped users, using manual or automatic mapping methods. ALM or JIRA users defined with an email address that is identical to the one used to log in to ALM Octane are automatically mapped for all user list fields. If a user has multiple email addresses defined in ALM or JIRA, only the first email address is synchronized with ALM Octane. If you defined a Default user for the ALM Octane endpoint, this user is mapped to the ALM or JIRA user. If no default is defined, synchronization fails. You can manually map this ALM or JIRA user to an existing ALM Octane user, or create a new user (either active or inactive) with the email address defined in ALM or JIRA. For details on adding or activating users in ALM Octane, see Assign roles and permissions. When you are done, re-run synchronization. Map ALM or JIRA and ALM Octane users manually if the email addresses are not identical, or if the ALM or JIRA user is not defined with an email address. Access the User Mapping dialog box. On the link configuration page, select a link to edit its user mapping. . How do I get to the Link Configuration page? From the More Actions menu Select More Actions > Edit User Mapping. On the Field Mapping tab, select a user list field, such as Assigned To. The selected field must be mapped to a user list field in the other endpoint. On the right, expand the User Mapping node, and click edit. The User Mapping dialog box displays only users mapped manually. Users mapped automatically are not listed. Periodically, use the Refresh button at the top of this dialog box to make sure you are working with the most up-to-date ALM Octane and ALM or JIRA user lists. Define default users for when there is no matching user in the destination endpoint. This may happen, for example, if a user once existed in an endpoint's user list, and is therefore listed as a user list value, but has since been deleted from the other endpoint's user list. Expand the Default user area, and define default users for destination endpoints in both ALM Octane and ALM or JIRA. Caution: If you map a user field bidirectionally, the default value will overwrite the value that no longer exists in the user list. peter@domain.com is listed as the owner of a defect in ALM Octane, but does not appear in the user list in ALM. When synchronizing the defect, peter@domain.com from ALM Octane is mapped to default@alm.com in ALM. After bidirectional synchronization, the defect in ALM Octane lists defualt@alm.com as the defect owner. See step #4 below for another solution for this situation. Select corresponding users from the dropdown menus for each endpoint, set the direction, and then click Add Mapping. Select Show unmapped only to display only users who are not yet mapped in the dropdown lists. In the Manual Mapping area, select an ALM Octane user name. In the ALM/JIRA Users box, type a name of a user that does not exist in the ALM or JIRA user list, and select the map to non-existing user entry. During synchronization, the user name that you mapped is entered in the relevant user fields, without adding it to the ALM or JIRA user list. Caution: In ALM, user fields can be set to Verify value. This means that in this field, ALM only allows users who exist in the user list. If you bidirectionally synchronize such user fields, using a non-existent ALM user could fail the synchronization. You can prepare a .csv file containing a list of user mapping pairs, and then import it to ALM Octane. Use <, >, or <> to specify the direction of the mapping. (Optional) Define default users for when there is no matching user in the destination endpoint. This means that if you synchronize a defect in JIRA with an author named John Doe and there is no mapping of this user in ALM Octane, the defect's author in ALM Octane will be OctaneUser1@acme.com. Select More Actions > Import User Mapping File. Browse to the file and click Import. A message appears showing the number of users imported from the .csv file. If users are not mapped explicitly in the file, the Synchronizer will try to map them automatically using e-mail address. A bi-directional mapping (<>) overwrites a uni-directional mapping. If the original mapping contains bob < bob@octane and the file contains bob <> bob@octane, the original mapping is overwritten, resulting in bob <> bob@octane. If the original mapping contains bob <> bob@octane and the file contains bob < bob@octane, the original mapping overrules the file mapping. Uni-directional mappings are merged. If the original mapping contains bob < bob@octane and the file contains bob > bob@octane, the result is bob <> bob@octane. The mapping in the import file overwrites the original mapping if the original mapping is uni-directional, or if both mappings are bi-directional. If the original mapping contains bob <> bob@octane and the file contains bob <> john@octane, the result is bob <> john@octane.